Of course these are number one on the list - how could they not be?! The staple of pretty much every bouquet and wedding, the ultimate symbol of love, the rose is the classic cutting garden flower and none should be without it! There's a rose for every garden; shade, sun, bed or wall. I have climbers, shrubs, patio roses, ground cover and a very enthusiastic rambler, all of which give me gorgeous scented blooms from early summer right into autumn. Companion plant with alliums to deter aphids and feed well; and if they're a variety at risk of black spot then add sulphur to the soil - though if you're in the middle of the countryside like me they'll probably get it no matter what variety they are, there are various fungicides that you can treat them with to fight it. My favourite variety at the moment is Joie de Vivre, a gorgeous apricot garden rose, but I love them all and would never be without them. This wedding bouquet from June is 100% garden grown - I can't even begin to describe how amazing it smelt! Dahlias used to be seen as a bit naff and dated, but they've had a bit of a resurgence recently and now there are countless amazing varieties out there that last really well as cut flowers and are so easy to grow. I start mine in pots in the greenhouse in March before planting out after the last frost which helps get a head start - they start to bloom in mid July this way and will keep going until the frosts start again, when you can dig them up, divide and store over the winter. Down here in the South you can get away with leaving them in the ground over winter, providing your soil isn't too clay-heavy and you mulch them really well - this will give you even earlier blooms but means you can't divide them to multiply your stock. It's a balance really, you may want to leave some in and lift others. My favourite varieties for growing are of course, the glorious 'Cafe au Lait', soft pink 'Wizard of Oz' and tiny white pompoms. I'm also excited to try 'Labyrinth' and 'Wine Eyed Jill' next year. Cafe au Lait taking pride of place in this centrepiece - another 100% garden grown design. I am basically obsessed with Hellebores. It's something about their pretty bobbing heads, the splashes of colour when little else is blooming and the way they interbreed to make new colours and patterns. Plus the sheer beauty of floating the heads in a bowl of water on the dining table on cold January days. They're another long game flower - not the cheapest, so buy small, plant out in partial shade and feed well, and before you know it they'll be covered in flowers. You can divide really big clumps to make new plants and they'll also self seed - I have a tray of little babies to plant out this week, they should flower in about 14 months time. Look in independent garden centres and plant sales - I paid £3 for good two-year-old plants last winter which could be £8+ in the big chains. They come in all shades of greeny-white right through the pinks to a deep, almost black, purple. The doubles are especially pretty, but with all types, wait until the seed pod has started forming in the centre of the flower for the longest vase life. 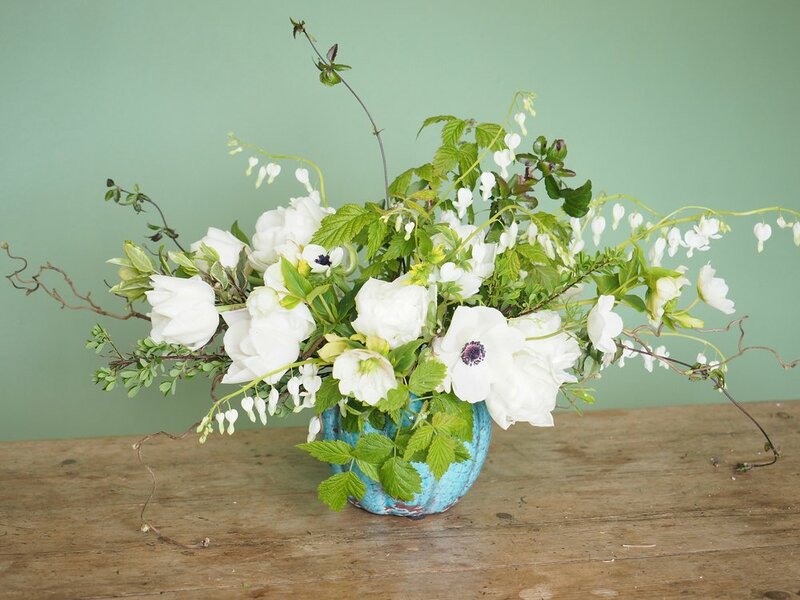 The Spring design from the cutting garden featured white hellebores, 'Mondial' tulips and white anemones, alongside Bleeding Hearts and plenty of gorgeous Spring foliage. Peonies, imported and cut too early with hard buds, are an endless cause of frustration to me in spring. Whether it's a massive wholesale order for a wedding or a bunch picked up with the weekly shop, there's always a (too high) percentage of them that just don't open. Or they go the other way, opening as soon as you get them home and shattering all over the floor. You can, however, bypass all of this stress by growing your own. They like to be planted at a fairly shallow depth, and you'll need to wait about three years until you start cutting them, but once they start there's no stopping them, and they'll reward you with beautiful blousy flowers every year. They die right back every winter so make sure you mark the spot where they are clearly so you don't accidentally dig them up - I use tent pegs but there are probably better ways! These Sarah Bernhardt peonies took pride of place in one of my first even wedding bouquets - this one smelt divine with herbs and sweet peas scattered throughout. They are the staple of gardens everywhere, often ignored for cut flowers despite their popularity on instagram. But I absolutely adore them and use them all the time. Hydrangea macrophylla are the most widely grown, changing from pink to blue depending on the pH of the soil, but paniculata 'Limelight', lacecaps and macrophylla ‘Ayesha’ which has tiny flowers that look like they came from a Playmobil kit, are all great bloomers and will be a useful addition to the cutting garden. The mopheads dry beautifully, and are invaluable for Christmas designs; and all of the varieties are ideal for large floral designs in summer and autumn. When conditioning, dip the stems in alum powder after cutting for maximum vase life and to reduce wilting when used in bridal bouquets. Pink hydrangeas cut early in the season when still quite small, garden roses and sweet peas - June in a bowl! You'll notice I've not included any spring bulbs in this list - these will be getting their own post next week, as now is the perfect time to be planting them. I've also not included the gorgeous bloom Chrysanthemums that are starting to become increasingly popular as I've never grown them, but it's something I'm keen to investigate for next Autumn so I will keep you up to date with my research! I'd love to know your favourite varieties of the flowers I've mentioned here, or if you have any others you think are worth looking at! Let me know in the comments and thanks so much for reading!